Lucknow: It was in 1995 that Uttar Pradesh got its first Dalit chief minister in Bahujan Samaj Party (BSP) leader Mayawati. The same year, the foundation was laid for a park in Lucknow, next to the Gomti river, meant to commemorate the contribution of Bahujan scholars and leaders to the country’s development. Over the years, as Mayawati returned to office for two short stints and one full term, more memorials came up. Built primarily in red sandstone, they house several imposing and towering statues of elephants, Dalit icons and Mayawati herself in at least six parks in the Noida and Lucknow. Now, these Dalit memorials and prerna sthals (sites of inspiration) may cost the BSP leader dear. The Supreme Court, hearing a 2009 lawsuit filed by two lawyers who alleged that Mayawati spent hundreds of crores of public money on the projects, said Friday that it was of the “tentative view” that Mayawati should pay back the public money spent on the project, posting the matter for a final hearing on 2 April. 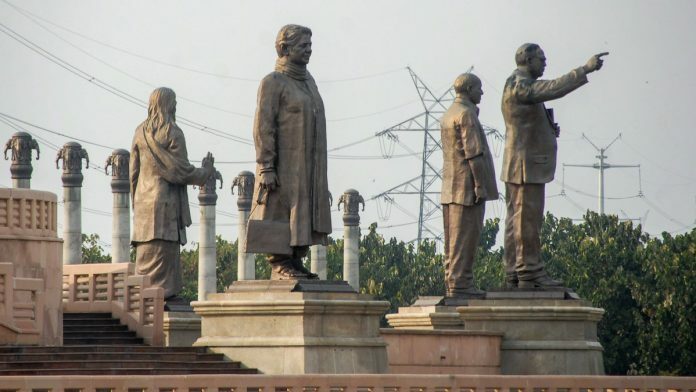 In light of the hearing, ThePrint explains the significance and journey of the memorials, which were built by Mayawati as a symbol of Dalit assertion. As chief minister for varying periods between 1995 and 2012, Mayawati set in motion a large-scale project to revive public parks in Lucnow and Noida by constructing Dalit memorials. The parks were to be beautified with fountains and stupas, meditation centres and exhibition areas. These memorials included large statues of B.R. Ambedkar, Gautam Buddha, Birsa Munda, Jyotibai Phule and Kabir, apart from those of Kanshi Ram and Mayawati. In Lucknow, at least 64 elephant statues flank the Ambedkar Park next to the Gomti river. In Noida, the National Dalit Memorial on the banks of the Yamuna house 24. The significance of the elephant for the BSP can be seen in the context of the party’s formation — the influence of Ambedkar and his adoption of Buddhism. BSP founder Kanshi Ram is believed to have chosen the elephant as the party’s symbol for a variety of reasons, one of them being that the animal was also the symbol of Ambedkar’s Republican Party of India (RPI). It was believed that the symbol would help the BSP in getting Ambedkar’s supporters under its fold. The elephant also becomes significant due to references to the animal in some Buddhist texts, with Gautam Buddha’s mother Mahamaya believed to have dreamt of a white elephant before his birth. The elephant is also said to depict the lower castes or the ‘Bahujan samaj’ — it’s an oft-cited analogy among ideologues that the Dalits are akin to a poorly-fed elephant, who does not realise its strength and goes about lifting loads and working hard day and night on the directions of the mahout, who is portrayed as a depiction of the upper castes. While rival political parties have criticised the memorials on various occasions, ahead of the 2012 state assembly polls, the Election Commission directed that all statues be draped ahead of the vote as the elephants are the BSP’s symbol. Days ago, the Enforcement Directorate conducted searches at various locations in the state as part of an investigation into alleged financial irregularities in the construction of these memorials. Erecting statues of deceased leaders is understandable. Why should she erect so many statues of herself and her party symbol from public money? Surely, public money ought not to be used for private party purposes.